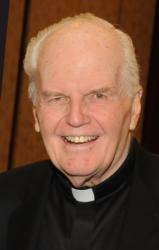 WASHINGTON (CNS) — Jesuit Father Charles Currie, a social justice advocate and longtime leader in Jesuit college education, died Jan. 4 after a recent illness. He was 88. A Philadelphia native, Father Currie is described as someone who had tireless energy, a keen sense of humor and legendary storytelling skills. The Jesuit priest was the former president of the Association of Jesuit Colleges and Universities who had also served as president of Wheeling Jesuit University in Wheeling, West Virginia, and Xavier University in Cincinnati. But many remember him not just for his leadership in higher education but for his advocacy work in response to the 1989 murders of six Jesuit priests, their housekeeper and her daughter in El Salvador. He was named special assistant to Georgetown University’s president to coordinate the school’s response to the murders, and his trips to the University of Central America, where these deaths took place, helped to inform Congress on the investigation’s developments. This work also led him to be a cofounder of the Ignatian Family Teach-In for Justice, which initially brought students to the School of the Americas in Fort Benning, Georgia, where members of the army unit that committed the murders in El Salvador had received military training. Now, the annual gathering brings nearly 2,000 students, faculty and staff from Jesuit colleges, high schools and parishes across the country to Washington every fall for advocacy training that honors the legacy of the Salvadoran martyrs. While at the helm of the Association of Jesuit Colleges and Universities, Father Currie oversaw the development of JesuitNET, the nation’s first Jesuit distance education network. He also created the Jesuit Leadership Seminar and coordinated a response to Hurricane Katrina that allowed students from Loyola University New Orleans to spend their fall 2005 semester at sister Jesuit institutions in the U.S.
After he retired from the association in 2011, Father Currie became executive director of Jesuit Commons, an initiative to provide online education to students in refugee camps. The program, now called Jesuit Worldwide Learning, grants diplomas and certificates accredited by two Jesuit universities: Regis University in Denver and Creighton University in Omaha, Nebraska. He began his academic career as part of the chemistry faculty at Georgetown specializing in photochemistry and he returned to Georgetown after serving as college presidents at two universities to direct Georgetown’s Bicentennial Celebration in 1989. The priest served on numerous boards of trustees of colleges, high schools and various organizations and associations. He had received 16 honorary degrees and other awards. In 2012, he was among a group of Catholic school leaders honored at the White House for their innovation and dedication. While in Washington, he developed friendships with many political leaders. Just this past summer, Father Currie offered a prayer during the 50th anniversary memorial for Robert F. Kennedy where he prayed that all those present at the Arlington National Cemetery in Arlington, Virginia, would share Kennedy’s compassion for the poor, the needy, the oppressed and the frightened. Father Currie’s wake will be held at Wolfington Hall at Georgetown University the afternoon and evening of Jan. 11 followed by an evening vigil service. His funeral Mass will be celebrated Jan. 12 after a viewing at Holy Trinity Catholic Church in Washington.